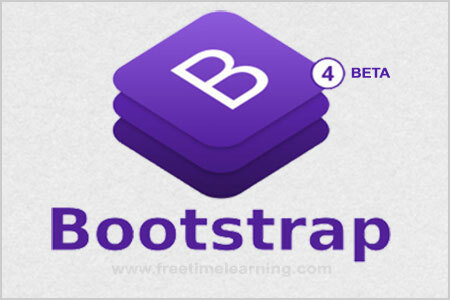 Bootstrap 4 alpha 1 was released on 19th August 2015. Since then there have been many alpha releases. And finally after that on 10th August 2017, Bootstrap released the first beta for the version 4 of Bootstrap. Bootstrap 4 Beta 2 was released on October 19th, 2017. The bootstrap is world's most popular frontend framework for building or developing responsive websites, mobile-first sites and web applications. Why Use Bootstrap 4 ? Browser compatibility : Bootstrap 4 is compatible with all modern browsers (Chrome, Firefox, Internet Explorer 10+, Safari, and Opera). Bootstrap 4 is the newest version of Bootstrap; with new components, faster stylesheet and more responsiveness. Bootstrap 4 supports the latest, stable releases of all major browsers and platforms. 5 tier grid system(xs, sm, md, lg, xl). Bootstrap 4 has removed the xs from the lowest break point. Therefore, col-* covers all devices (no need to specify the size in this case). Added inverse tables with the .table-inverse class. Added table head styles with the .thead-default and .thead-inverse classes. Bootstrap 3 doesn't use the .table- prefix for its contextual classes. For example, Bootstrap 3 uses .active whereas Bootstrap 4 uses .table-active. Other than that, both versions use the same 5 contextual keywords (active, success, info, warning, danger). Added the .table- prefix for its contextual classes. The .table-responsive class must be added to a parent div element. Can add .table-responsive to the actual table element. Added reflow tables with the .table-reflow class. Reflow tables have now been dropped. Horizontal forms require the .form-horizontal class. Forms don't require .row when using grids (although this class is still a requirement on Bootstrap 3 grids in general). Bootstrap 4 dropped the .form-horizontal class — it is no longer needed to display horizontal forms. Forms require the .row class when using grids. Use .control-label when using grids for form layout. Bootstrap 4 uses .col-form-label * when using grids for form layout. * Note that Bootstrap 4 initially used .form-control-label but subesquently changed this to .col-form-label. Uses .radio, .radio-inline, .checkbox, or .checkbox-inline to display checkboxes and radio buttons. Uses .form-check, .form-check-label, .form-check-input, and .form-check-inline. Use .input-lg and .input-sm to increase or decrease the size of an input control. Use .form-control-lg and .form-control-sm to increase or decrease the size of an input control. Use the .help-block class to display help text. Bootstrap 4 uses the .form-text class to display help text. Bootstrap 4 forms don't have an official class for help text. Instead, the .text-muted class was introduced for more flexibility. Includes validation styles for error, warning, and success states on form controls (for example, .has-warning). To present icons on the input fields using Bootstrap 3, use glyphicons. Validation styles are not available for Bootstrap 4 forms. Use custom Bootstrap form validation messages instead. No classes for styling the form legends. Provides the option of using .col-form-legend on legend elements to style it more like a label. Bootstrap 4 introduced custom forms — completely custom form elements that replace the browser defaults. Includes the .btn-default and .btn-info classes. The .btn-secondary class isn't available in Bootstrap 3. Introduced the .btn-secondary, .btn-light, and .btn-dark classes. Note that the .btn-info class was initially dropped in Bootstrap 4 but then reappeared again. Introduced the .btn-outline-* classes for styling buttons with an outline color. Introduced the .btn-*-outline classes for styling buttons with an outline color. (The .btn-*-outline classes became .btn-outline-* in Alpha 3). The .btn-xs class is available. Dropped the .btn-xs class (only .btn-sm and .btn-lg are available now). Use .pull-right, .pull-left, and .center-block helper classes. Uses .m-x-auto instead of .center-block to align block-level images. Can also use the various .pull-*-right and .pull-*-left responsive helper classes, as well as the .text-*-left, .text-*-center, and .text-*-right helper classes on the image's parent. Can use the various .pull-*-none classes to disable floating. Includes many different classes for media objects, including .media, .media-body .media-object, .media-heading, .media-right, .media-left, and .media-list and .media-body. Uses just .media class. Margins can be applied using spacer utilities. Media objects are flexbox enabled in Bootstrap 4, so the various flexbox classes can also be applied (such as reordering, etc). Apply dropdowns to lists (i.e. using ul and li). Dropdowns can be built with ul or divs. Apply the .dropdown-item to a a or button element and wrap them all in a div (or ul) with a .dropdown-menu class applied. Apply .dropdown-header to the li tag. Apply .dropdown-header to h1 - h2 tags (as Bootstrap no longer uses li tags to build dropdowns). Apply the .divider class to the li element (because it used lists to build dropdowns). Apply the .dropdown-divider to the div element. Apply the .disabled class to the li element. Apply the .disabled class to the a element. Supports justified button groups (via the .btn-group-justified class). Supports extra small button groups (via the .btn-group-xs class). Not supported (dropped the .btn-group-xs class). There is no .nav-inline class. Can use the .nav-inline class to explicitly specify navs to be displayed inline. Limited (preset) color options. Supports inverse navbars but not the other classes. New (preset) color options. Introduced the .navbar-light and the .navbar-dark classes, and allows the .bg-* classes to be used on navbars. Use .navbar-right, .navbar-left to align components within the navbar. Use the various .pull-*-right and .pull-*-left responsive helper classes. Can also use the various .pull-*-none classes to disable floating. Can either use spacing utilities such as .mr-auto, or any of the flexbox alignment utilities. Add the .navbar-form class to forms within navbars. Bootstrap 4 dropped the .navbar-form class. It's no longer necessary. Uses .navbar-fixed-top and .navbar-fixed-bottom to fix navbars to the top or bottom. Only requires .pagination to be added (to the ul element that represents the list of pages). Must also add .page-item to each li element and .page-link to each a element. Uses .previous and .next for aligning pagers. Pagers have been dropped in Bootstrap 4 (Alpha 3). Uses .pager-prev and .pager-next for aligning pagers. The .label-pill class is not available. However, Bootstrap 3 does have badges (which achieves a similar visual effect). Labels have been replaced by badges in Bootstrap 4. Badges can use the .badge-pill for rounded corners. "Tags" are called "Labels" in Bootstrap 3 (i.e. they use the .label class). The .tag class was introduced in Bootstrap 4 (Alpha 3) to replace the .label class. This was done to disambiguate from the label element. Tags have now been renamed to "badges". These replace labels from Bootstrap 3. The .jumbotron-fluid class is not required on full-width jumbotrons. Introduced the .jumbotron-fluid class for full-width jumbotrons. Doesn't use the progress for progress bars. Instead, applies progress bar classes to nested div elements. Uses the HTML5 progress element when working with progress bars. Using the progress element was abandoned in Alpha 6. Bootstrap 4 now uses the divelement again. Bootstrap styles are applied to the blockquote element by default. Introduced the .blockquote class for styling the blockquote element (i.e. styling this element is now opt-in). Use .blockquote-reverse to align a blockquote to the right. Use the text utilities to align blockquotes (.text-center and .text-right). The .page-header class is supported. The .page-header class is not supported. The .dl-horizontal class was used to declare a horizontal list. Horizontal lists are now declared with the .row class on the dl tag, then any of the grid system's predefined classes to the dt and dd tags. Supported. You can specify a layout to be non-responsive. Apply .list-group-item to the a element. Apply .list-group-item-action to the a element. Uses .in to have content expanded upon page load. Uses .show to have content expanded upon page load. Introduced in Bootstrap 4. Cards replace functionality that was previously provided by panels, wells, and thumbnails. Not supported. Use cards instead. Uses the .breadcrumb class against the ul tag. Also requires .breadcrumb-item to be applied against all li elements that make up the breadcrumb. Breadcrumbs can also be used outside of lists. For example, the .breadcrumb-item could be applied to a bunch of a elements that are wrapped in a .breadcrumb element.